During and after World War One the Ottoman Empire committed the Armenian Genocide. It's an event which is, to my mind, incontestable, and yet is still contested, at least my modern day Turkey. And yet, to my mind, even if we know vaguely that it happened, it isn't something that is perhaps much discussed or understood even though it clearly has contemporary resonance with IS targeting minority ethnic and religious groups in modern day Iraq and Syria. Tragically, it feels like there will be always be displaced peoples and shocking acts of brutality. 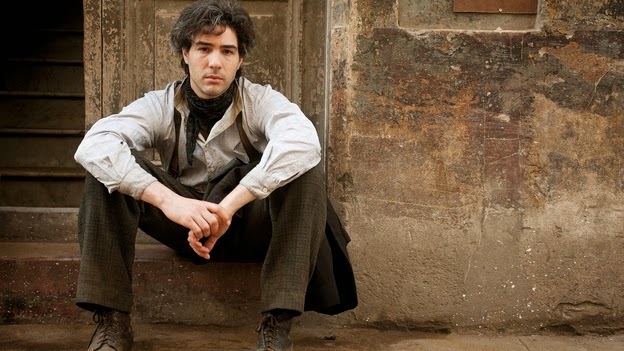 In Fatih Akin's new film, THE CUT, the impact of the Armenian Genocide is shown through the eyes of a blacksmith called Nazret (Tahar Rahim - UN PROPHET) who by some fortune is saved from a death-march and execution - the cut across the throat that renders him speechless for the rest of the film. And so we enter a kind of road-movie as Nazret retraces his steps back to his village to try and find his family and then follows that hope through Syria and Lebanon, to Cuba and ultimately America. Throughout the journey he will receive charity and kindness and hope, but also pettiness and insults. It's a telling moment when his first contact with America is a redneck pulling a gun on him. The most powerful scenes in the film occur, unsurprisingly, early on as we witness the height of the genocide. There's a particular scene where he goes back to his village which has been displaced to tents in the desert outside. The women are literally starving and dying before his eyes. It's utterly awful - rightfully awful - to watch. As we move away from that scene the movie takes on a more melancholic and almost fairytale tone. As journey leads to further journey, we know that the chances of Nazret finding his family must be slim to none. And yet we have to believe that this mute blacksmith will find them, otherwise the cruelty would be too great to bear. We will the movie to undercut its earlier realism with an ending that can at least partly assuage our pain. Writer-director Fatih Akin has to be congratulated in daring to make what must be the definitive Armeninan genocide film to date, and yet allowing it to have some heart. This movie is a giant leap forward from EDGE OF HEAVEN, both technically and narratively. I have to give special praise to the cinematographer Rainer Klausmann who captures the beauty of landscapes from Armenia to America channeling the great Westerns - the photography is simply breathtaking. But I also congratulate the composer Alexander Hacke aka Die Einstürzenden Neubauten. He keeps a heartbreaking story from feeling sentimental or a faded memory with his urgent and powerful score that skilfully takes on the cultures that Nazret travels through. But the ultimate praise is really for Mardik Martin - the scriptwriter who last worked on RAGING BULL - for having the insight and intense response to this historic tragedy. How finally wonderful that it should be the result of a Turkish director and Armenian screenwriter working together. THE CUT played Venice and London 2014. It goes on release in Germany on October 16th, in Switzerland on January 114th, in Romania on February 27th and in the Netherlands on March 19th. The movie has a running time of 138 minutes.